(NaturalNews) The oil of the peppermint plant has remained a central component of many medicine cabinets for centuries, for good reasons. Aside from being a proven anagesic, expectorant and carminative, this intense and aromatic oil is a potent anti-inflammatory that is well-known for treating gastrointestinal conditions, such as indigestion and stomach spasms, in a gentle and natural manner. Emerging evidence also suggests that it can even treat irritable bowel syndrome. Though it is widely used as an internal medicine, peppermint oil also provides several cosmetic benefits. It is particularly effective at improving the health of our mouth, hair, nails and skin. Since peppermint oil is a proven antibacterial, antimicrobial and antiseptic, it can help kill many of the harmful microorganisms in our mouth that contribute to tooth decay. 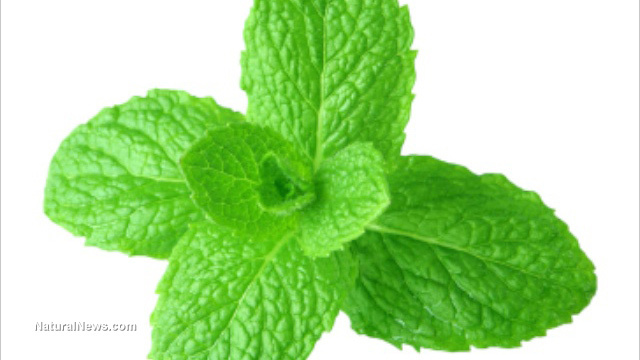 Moreover, one of the main active ingredients in peppermint oil, menthol, is shown to treat bad breath. To create a mouthwash using peppermint oil, mix 3 or 4 drops into a small amount of purified water and swish the solution around your mouth for 30 to 60 seconds. For even better results, consider adding a teaspoon of baking soda to the mix; this will boost its tooth whitening properties. There are several reasons why peppermint oil is often found in commercial shampoos and conditioners. It possesses considerable regenerative and stimulating effects that can relieve scalp irritation, promote hair growth and rejuvenate existing hair. It also creates a cooling sensation on the scalp that makes the whole head feel refreshed and invigorated. Here's a simple natural shampoo recipe for you to try: Add 10 drops of peppermint oil, 3 tablespoons of olive oil, 10 tablespoons of baking soda and 6 ounces of aloe vera gel to 7 ounces of purified water. This shampoo, which can be stored in a bottle for future use, is far more nourishing than commercial shampoos and is free from chemicals that strip the hair of its natural oils. Fungal nail infections, such as athlete's food and ringworm, affect many people around the world. Though they are seldom a medical concern, they are a cosmetic one and, of course, often cause persistent itching and other undesirable symptoms. Fortunately, peppermint oil can treat fungal nail infections due to its considerable antifungal properties. Simply apply the oil to the affected area once or twice daily until the infection heals. Peppermint oil is a fantastic choice for individuals seeking healthier and more youthful looking skin. It is a known astringent that can prevent the clogging of pores (peppermint oil is a very effective natural remedy for acne). Its high concentrations of menthol help cool the skin and brighten dull patches. It also helps cleanse the face of accumulated debris. While a solution made from peppermint oil and water is perfectly sufficient for topical application, adding other skin-friendly ingredients to it, such as apple cider vinegar and aloe vera gel, will increase its potency.